Highway bar kit includes 1-1/4" diameter mounting arms and footpegs which mount directly to the front frame down tubes. The mounts allow for an 8" range of motion, 4" forward, or 4" backwards from the center line of the frame tubes. They clamp securely to the frame and will not slip. Kit is CNC machined from billet aluminum and triple chrome plated. 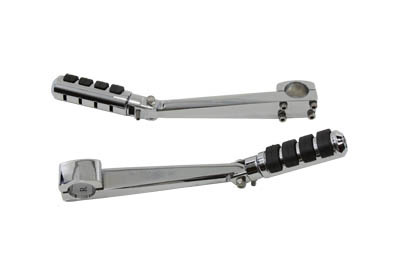 KIT includes stainless steel hardware and cats paw anti-vibration footpegs. This product was added to our catalog on Tuesday 07 January, 2014.